Rumor has it that Apple is planning to produce its own CPUs and GPUs for Macs. Those T2 processors we have today are just a tiny first step—the big leap is to take something like the A12X and build a MacBook around it. It makes sense from the perspective of both power-to-performance ratio and a cost-to-performance ratio. Perhaps more importantly, it puts Apple fully in control of its whole platform, and allows the company to innovate in ways it can’t when it cedes the very heart of its computers to other companies. For these reasons and more, I think it makes sense to begin transitioning macOS to ARM and for Apple to produce computers with its own CPUs and GPUs inside. But that transition will take years. While that’s going on, Apple should kick Intel to the curb and go all-in with AMD. The consumer chips AMD will ship this year—new third-generation Ryzen chips based on the Zen 2 core and the Ryzen Threadripper high-end desktop and workstation chips with the same technology—are going to do more than give Intel a run for its money. The current generation of these chips already meet or beat Intel in nearly all tasks except for high-end gaming. And let’s face it, as much as I love Mac games, gaming is just not a strong market for the Mac. We’ve only had small sneak peeks at the new 7nm products AMD is shipping this year, but the company is crushing it. 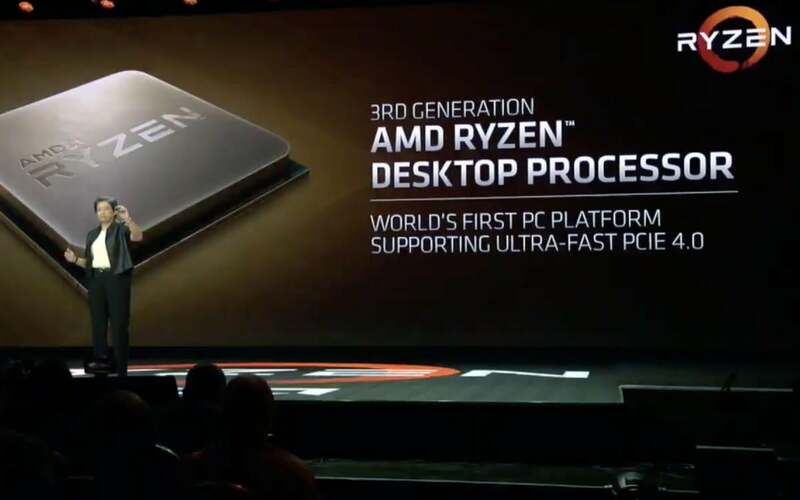 During its CES keynote, AMD showed an early engineering sample of the new third-generation Ryzen chip, running at a reduced speed. Even so, it beat out a Core i9-9900K in a Cinebench test. That’s an impressive feat, considering that both chips had the same 8 cores and 16 threads. 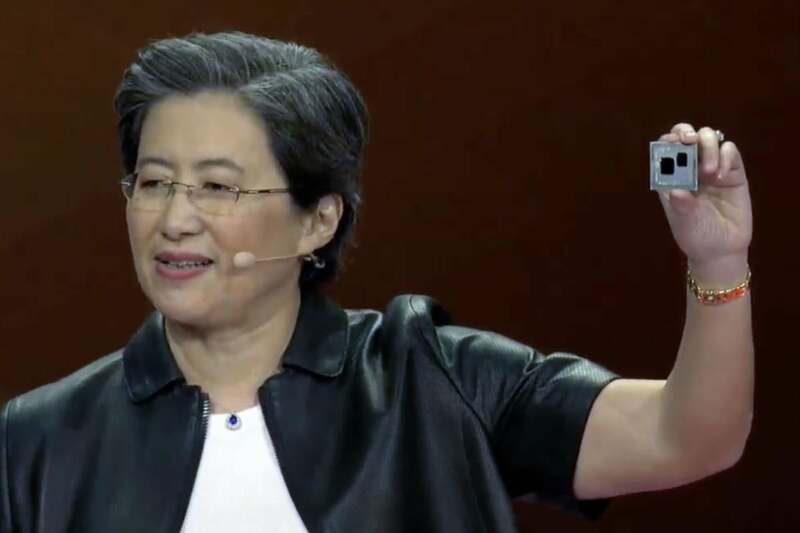 But when AMD’s Lisa Su held up the Ryzen chip that was demonstrated, the layout was conspicuous. It looks like there is deliberate room left for a second 8-core, 16-thread “chiplet,” which makes me think that the company played it close to the vest in showing only its 8-core version. 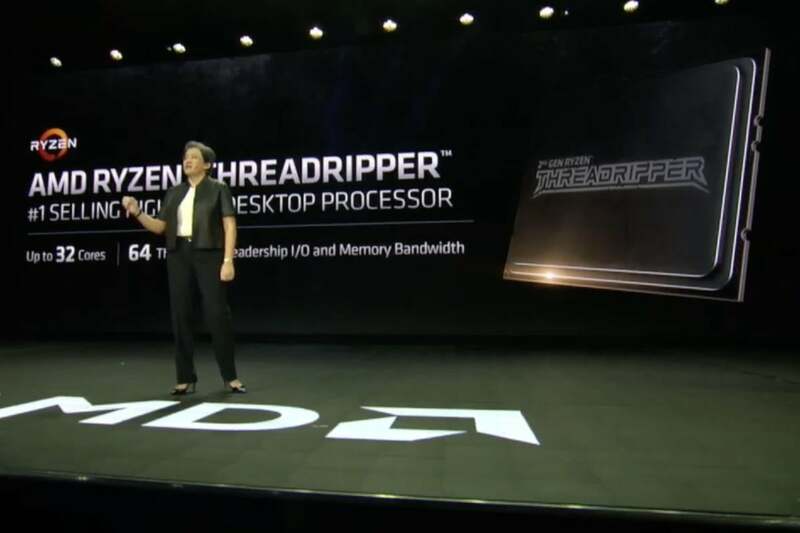 If AMD can match or beat Intel core-for-core, and can ship a 16-core, 32-thread regular ­desktop CPU, they’re almost certainly going to take the overall performance crown, despite the improvements Intel will make this year. Hmm…looks like they’re leaving room for anotehr 8 cores and 16 threads on there. AMD’s CES demo was significant in another way, too. The third-generation Ryzen test system used about 25 percent less overall power than the Intel system. If the final chip is clocked a bit higher, that gap may narrow, but it’s a huge deal that AMD is matching or exceeding Intel’s performance with early silicon at significantly lower power draw. Already, the iMac Pro would be better off with 2nd-gen Threadripper inside. Imagine the leap the 3rd-gen verison would bring. Apple has never been a price leader, but it certainly doesn’t want to pay more for its CPUs than it has to. Ever since the launch of Ryzen in 2017, AMD has offered exceptional performance-per-dollar. Even its highest-performing desktop chips (which are often faster than Intel’s in many tasks) can cost hundreds of dollars less. Apple loves fast I/O. Hey look, AMD will deliver PCIe 4.0 first! Naturally, a huge and prestigious manufacturer like Apple doesn’t pay street prices. But it’s hard to imagine AMD wouldn’t be able to undercut Intel’s pricing, allowing Apple to pass some of those savings on to customers. AMD is already the sole provider for Mac GPUs (in those Macs that have discrete graphics), and it would be a huge “get” to pull Apple’s CPU business away from Intel, even if it’s just on the desktop. It could be worrisome to change CPU vendors…why bother if it’s just going to be a few years before Apple has its own CPUs inside all Macs? But a switch like this one has more in common with switching from Nvidia to AMD. For most developers, it would be all but invisible. The broad compatibility between Intel and AMD CPUs means that developers wouldn’t have to do a lot of work. In fact, most apps would “just work” with no changes at all. Developers who want to really optimize for AMD’s architecture will find lots of familiar tools to do so. In fact, some of AMD’s best optimized code is found in the Linux community, which is a smaller hop to macOS than Windows. Compared to making an app run on ARM, making the entire current macOS catalog work on AMD’s Ryzen processors would be a cinch. Apple seems more interested in becoming a services company than selling a lot of desktop computers, but it doesn’t make Macs for nothing—it’s still important to move some hardware. In fact, Mac sales have been stagnant lately, and could use a bit of a boost. In the long term, the innovation that can come from Apple producing its own Mac processors is the best way to address that. In the short term, it never hurts to have a bunch of rabid fanboys who are psyched to buy your computer because it uses their favorite company’s processors and GPUs. There are Intel fans and there are AMD fans, but the AMD fanbase has the sort of ride-or-die, “always the underdog” attitude that should fit right in with Apple. If you don’t think an AMD fan is going to consider buying their first Mac just because it has a Ryzen Threadripper chip inside, you haven’t met an AMD fan. The performance of the A12X in the iPad Pro is already good enough for a thin-and-light MacBook, but it’s several times slower than an 18-core iMac Pro’s Intel processor from a year earlier. Then there’s GPU performance, memory bandwidth, tons of PCI Express lanes…in short, Apple is pretty close to building all the components it needs for a great thin and light MacBook, but years away from the sort of big high-power chips needed for future iMac Pro and Mac Pro desktops. That’s okay. The ARM Mac transition, if it’s going to happen, should start with thin and light laptops first and move up the product stack from there. Not only are Apple’s current A-series chips much closer to meeting the performance and feature expectations of those laptops, but the inevitable compatibility issues will be less of a problem. The thin-and-light Mac laptops—the MacBook and MacBook Air—are consumer devices. People use them to browse the web, check email, listen to music, watch videos, and maybe do a little light content creation (modest photo editing and the like). If macOS transitions to ARM, it will require developers to do a lot of work re-writing apps, but the consumer needs of the MacBook Air set can be almost entirely met by Apple’s built-in apps. With a few exceptions, consumers can switch apps fairly easily; if their favorite note-taking app does not have an ARM-compatible version, they can try another. But high-end Mac desktops—the iMac Pro and Mac Pro—are made for people who do big video editing jobs, 3D modelling and animation, and high-end image editing (like movie posters). The pro apps they rely on are updated frequently to add new features, but major shifts to a new architecture can take years. And customers can’t easily jump to a competing product—they may have to convince their company to buy it first, and then they have years’ worth of legacy data and libraries to contend with. I think Apple should transition the Mac line to ARM, and should start with the MacBook and MacBook Air. As Apple develops ever bigger and more powerful chips, it can replace x86 processors with its own ARM chips in the MacBook Pro, then the iMac, then the iMac Pro and Mac Pro. And in the years it takes the company to develop those chips and ship those products, pro-level application vendors will have all the tools and time necessary to transition their software. So, even if the transition to Apple processors in Macs starts this year and happens quickly, it will probably take a few years before the entire lineup has an Apple processor inside. During that time, the company should look to AMD to meet its x86 processor needs. And if Apple doesn’t transition to ARM, all the more reason to get behind the company making the most exciting x86 desktop processors.